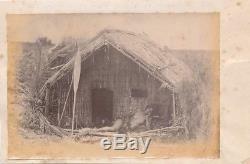 Original Photo of Maori House , Maori with Patu & Paddle , New Zealand C1885 Albumen print. 14.5 x 9.6 cm. The item "Original Photo of Maori House & Maori with Patu & Paddle New Zealand C1885" is in sale since Wednesday, August 1, 2018. This item is in the category "Collectables\Photographic Images\Antique (Pre-1940)\Other Antique Images". The seller is "photo428" and is located in Surrey. This item can be shipped worldwide.